Disclosure: I received clothing for free for this sponsored post from Aventura. I promised to review the product, honestly, with all opinions as my own! I'd never heard of Aventura, until I got an e-mail asking if I'd be interested in reviewing the company's clothing. To be honest, I wasn't entirely sure that it was my style. I'm more indoorsy than outdoorsy, and it felt kind of crunchy. But when I read about Aventura's sustainability efforts, I decided to give it a go; I certainly don't dress sustainably on a daily basis, but I was interested in whether or not I'd like the fabrics. Thanks to Lauren for taking pics before dinner! After sending over a list of clothes that I liked on their site, Aventura sent me two pieces: the Easton dress and a pair of leggings. The first thing I noticed? Quality! The Easton dress has so many nice details with pintucks and the back yoke, and the fabric was incredibly soft. It had a great thickness and felt so comfortable to wear at the office all day. The leggings were super soft as well, and they have an amazing stretch. It was feminine yet functional, and not the assumed crunchy look I'd imagined; I was able to express my own style. Aventura produces fashionable and comfortable clothing with a low environmental impact. They try to avoid chemical pesticides and choose organically farmed cotton. Over 75% of their styles use lower impact or sustainable materials. 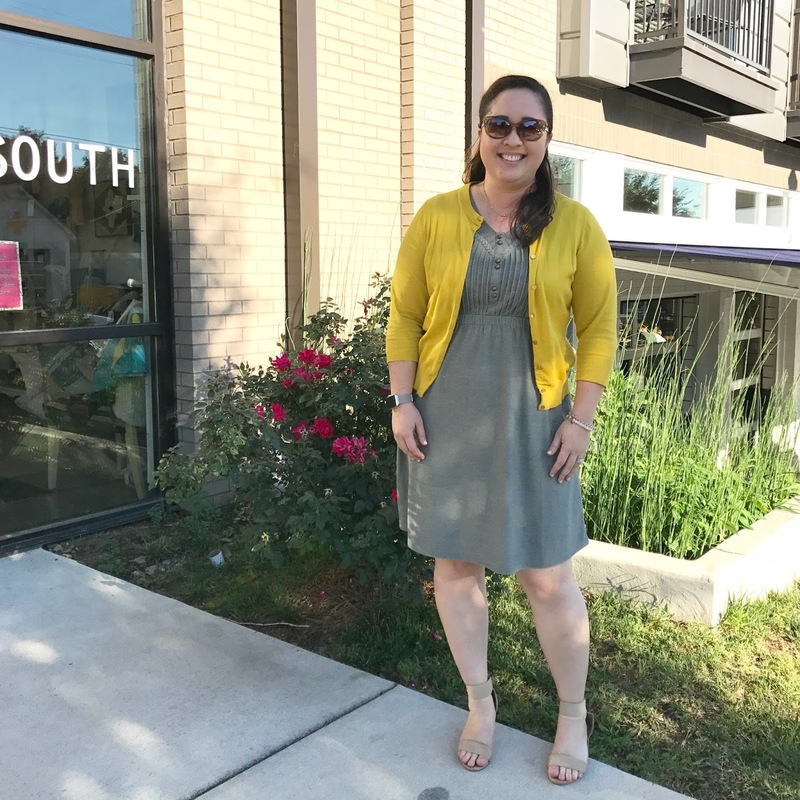 I wore a cardigan due to the A/C in my office, and I liked how the grey-green could go with a variety of different colors. After these photos, I ended up taking the sweater off to have dinner with two of my friends outdoors in Nashville. See, I go outside! Zero complaints after wearing this dress all day, and into the night. I kept touching the fabric because it was so soft. Overall, I loved the quality and the sustainable sourcing of Aventura clothing! I wouldn't hesitate to shop this brand!